Fresh hop beer season is here! 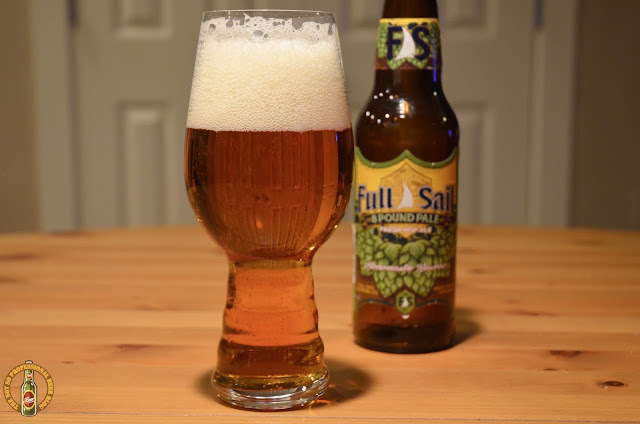 Full Sail Brewing Co. is celebrating this wonderful seasonal event with the second release of 8 Pound Pale Fresh Hop Ale. Last year, the brewery showcased Magnum hops. This year, it's all about Centennial! This is a limited Brewmaster Reserve release, and will be available from late September until it's gone. It didn't last long last year, so don't wait too long. For more details, check out Full Sail's news release below. Hood River, Oregon – Full Sail Brewing Co. is excited to release this year’s Brewmaster Reserve 8 Pound Pale Fresh Hop Ale, brewed with eight pounds of local, freshly harvested Centennial hops per barrel. Full Sail brewers Chris Davis and Greg Doss drove to B&D Farms in Saint Paul, Oregon on harvest day last month to procure fresh, wet hops from the field, immediately heading back to the brewery to work their magic on this small-batch brew that goes from farm to tank in three hours. Brewmaster Reserve 8 Pound Pale is a hop lover’s delight. Each fall, Full Sail brewers look forward to brewing a fresh hop beer to celebrate the hop harvest, using eight pounds of fresh hops per barrel. Each hop variety reaches peak maturity at a different time during harvest, so each year’s brew is unique. Be sure to try this batch of 8 Pound Pale before it’s too late! Full Sail’s Brewmaster Reserve series allows the brewmasters to put their creativity, innovation and passion into small, limited-release beers. These craft brews highlight the direct connection with Full Sail’s farmers, celebrate the art of barrel aging, and explore the effects of time. Over the years, Full Sail’s Brewmaster Reserve series has earned 26 gold medals. Some of our beers, like our fresh hop brews, are meant to be enjoyed just after harvest, intensely fresh from our farmers’ fields. Brewed in small batches, Brewmaster Reserve 8 Pound Pale Fresh Hop Ale is available in limited quantities from late September until it’s gone - in Brewmaster Reserve 6-packs, 12 oz. bottles and draft. 5.6% ABV, 54 IBUs. It's good to know that there are many beer events that showcase different kinds of beer and also helping small beer brewers showcase their products. Wow this is really cool. I really love this site, as this site is providing so much information, and also reviewing about different bear. And this beer is looking so heavenly. Thank you for uploading this! !